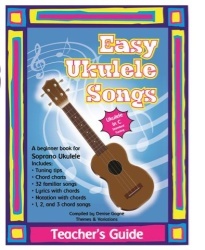 Easy Ukulele Songs Teacher’s Guide (C tuning) is an excellent song collection to teach young beginners to sing and strum on the ukulele. The collection includes 32 folk songs with a performance/accompaniment CD, projectables, chord charts, reproducible student lyrics pages, and links to easy pop songs to play along with. The first 15 songs use just one chord. The next 15 songs are very easy two chord songs, and there are two songs that use three chords. C Tuning is the standard tuning for ukulele. If students find music online or buy ukulele books at a music store that they want to play along with, it will be in C tuning. If you want to add Orff instruments or recorder to your ukulele performance, C tuning will be the easiest. For those teachers that prefer to use the D tuning, these resources are also available in D tuning. What Shall We Do With the Silly Sailor?